We were having very good results printing with the black PLA without any extra cooling, but the green PLA that we wanted to use was not so cooperative. PLA tends to stay soft for a little time after extrusion. While this is nice because it lets the printed layers fuse together well, it can also cause the finer details of your prints to warp and sag. One advice commonly found on the Internet says to add a small fan to blow cold air over your print, to make the PLA cool down faster. It seemed worth a try. There are numerous designs for fan mounts available on thingiverse.com. 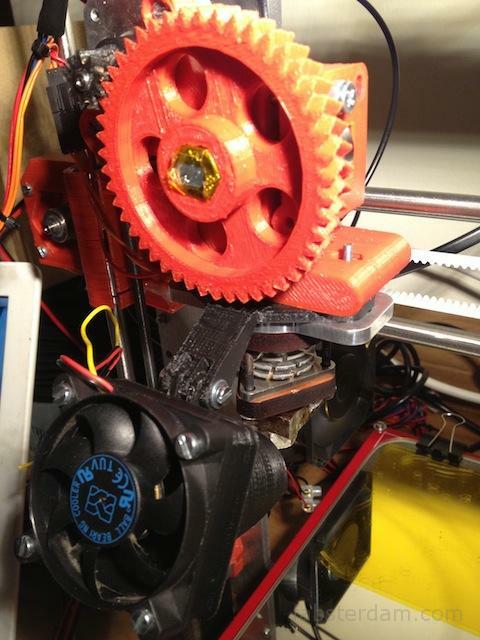 All attach to the extruder carriage in some way, so it’s important to select a mount that fits your carriage. 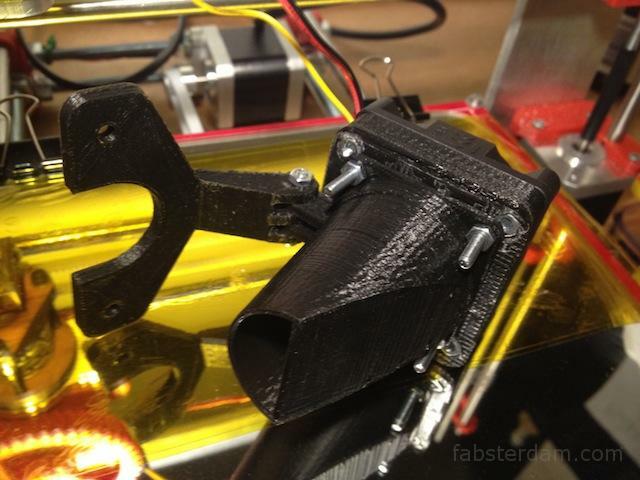 We found this design, consisting of an air duct and a mounting arm, which fit our i3 extruder carriage perfectly. Because we only had a 50mm fan available and the fan mount was built for a 40mm fan, we also needed an adapter. Again, thingiverse had one available. The picture above shows the two combined with a standard 50mm fan salvaged from an old CPU cooler. Adding the fan assembly to the printer is easy: the fan mount goes between the bottom of the extruder carriage and the hot end (a Budaschnozzle 2.0 in our case). The angle of the air duct is adjustable so you can aim the air flow pretty accurately. You want to cool your print area, not the heater block of your hot end, obviously. After recalibrating the bed height we were ready to go! 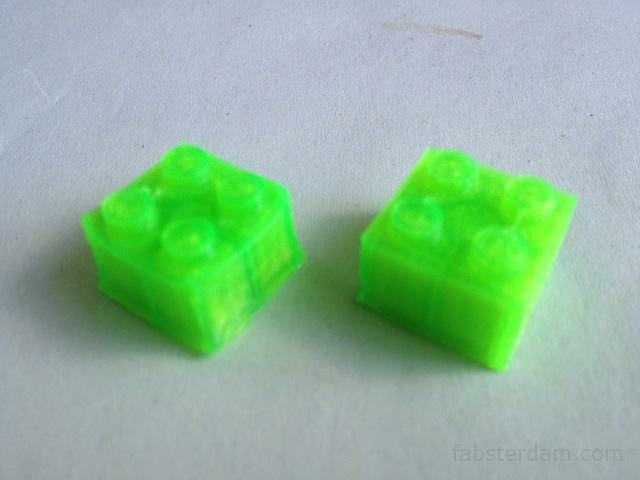 Having a cooling fan aimed at the print area made a big difference for the prints with the green PLA. On the left is a print that was made without the fan, the one on the right was printed with the fan blowing. If you look at the corners of the left block, you can see some warping (the corners curl up). Also, the print has sagged a little at the base and the edges are rounded. On the right print, the corners are nice and sharp and there is no sagging.